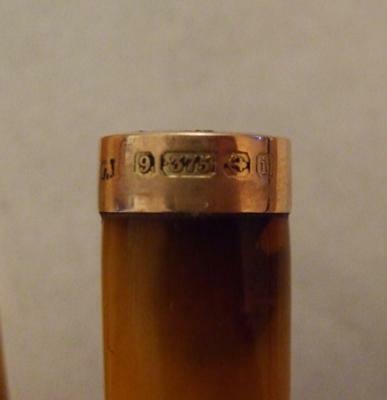 I have a cigarette holder made of bone or plastic and the top looks more like a copper colour than gold. The hallmark is G.J - 9 -.375 - an anchor lying on it's side and the letter i.
I can't say for sure who the G.J is. Because the top looks more copper than gold I don't understand how it can have a gold hallmark. I think the letter 'i' refers to 1924 but I saw several different references to this so really unsure now. It comes in a silver case, where the top has been worn away so part of the hallmark is missing. possibly H.P & S (followed by a thick hyphen) then 'k' - a 3 leg lion? - and possibly a cat head. It even looks like a second hallmark has been imprinted on top of the initials so this is putting me off. It looks like the lover half of the letters S B.
I seem to be running round in circles trying to date this.